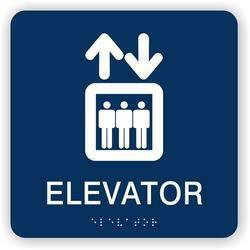 Providing you the best range of braille signage for elavators and paper stickers with effective & timely delivery. Gyb These specifications define the size of braille dots and the distance between them on signage as recommended by the Australian Braille Authority. These specifications were revised in February 2014. While these standards allow for a range of dimensions, there should always be internal consistency on a sign with a maximum of 1% variation. A braille character is composed of a combination of dots from a matrix of three rows and two columns, known as a cell. Spherical radius r is related to the dot base diameter d and dot height h, as illustrated in the diagram below. Our company is engaged in manufacturing a wide assortment of attractive Paper Stickers in sheet form that are broadly used as printing label and sticker paper. We offer these stickers in various sizes, designs and colors. In addition to this, we also provide customized solutions to our reliable patrons. These are printed using latest screen printing as well as offset printing. Our range of paper stickers is available in variety of adhesives that are free from residual effect and are difficult to peel off from the pasted surface.